The Workman of Paris; or, The Drama of the Wine Shop. (author unknown, composer Mons. Artus) Tableau 8 (James Gates) Quai des Ormes with view of Seine and Paris by moonlight. 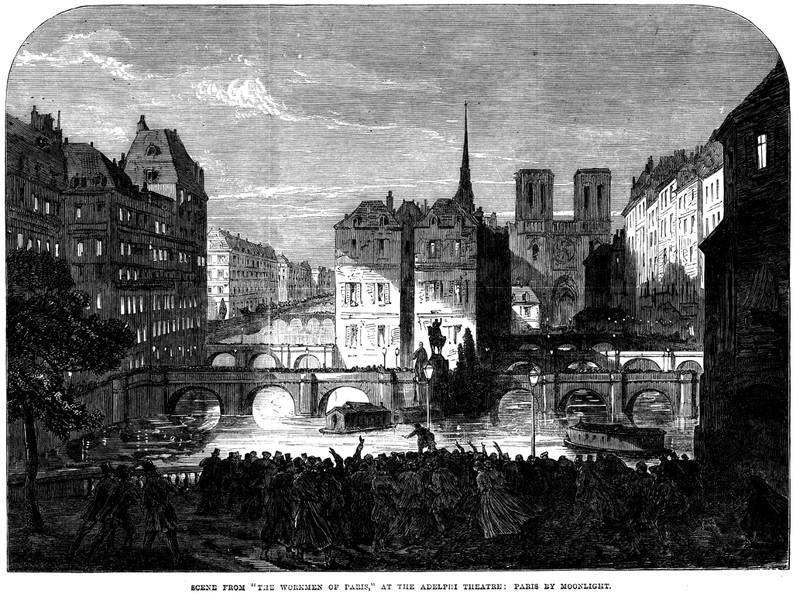 SCENE FROM "THE WORKMEN OF PARIS." 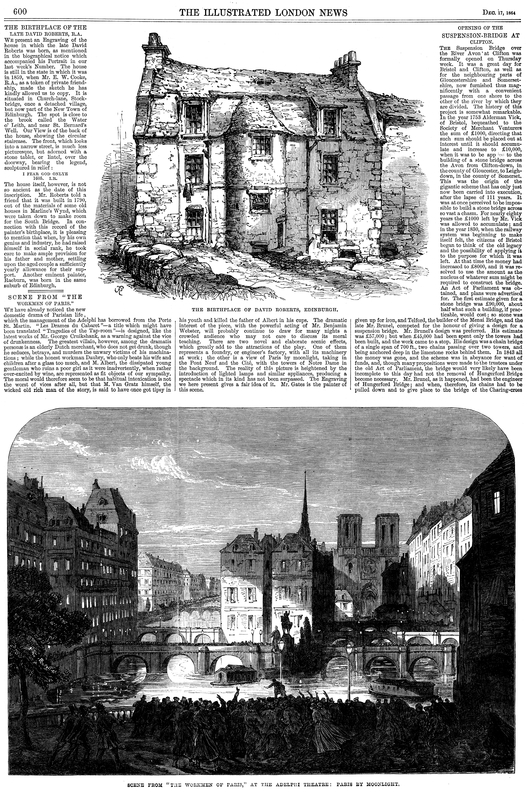 We have already noticed the new domestic drama of Parisian life, which the management of the Adelphi has borrowed from the Porte St. Martin. "Les Drames du Cabaret"--a title which might have been translated "Tragedies of the Tap-room"--is designed, like the latest works of Mr. George Cruikshank, as a warning against the vice of drunkenness. The greatest villain, however, among the dramatis personæ is an elderly Dutch merchant, who does not get drunk, though he seduces, betrays, and murders the unwary victims of his machinations; while the honest workman Daubry, who only beats his wife and children after a glass too much, and M. Albert, the dissipated young gentleman who ruins a poor girl as it were inadvertently, when rather over-excited by wine, are represented as fit objects of our sympathy. The moral would therefore seem to be that habitual intoxication is not the worst of vices after all, but that M. Van Gratz himself, the wicked old rich man of the story, is said to have once got tipsy in his youth and killed the father of Albert in his cups. 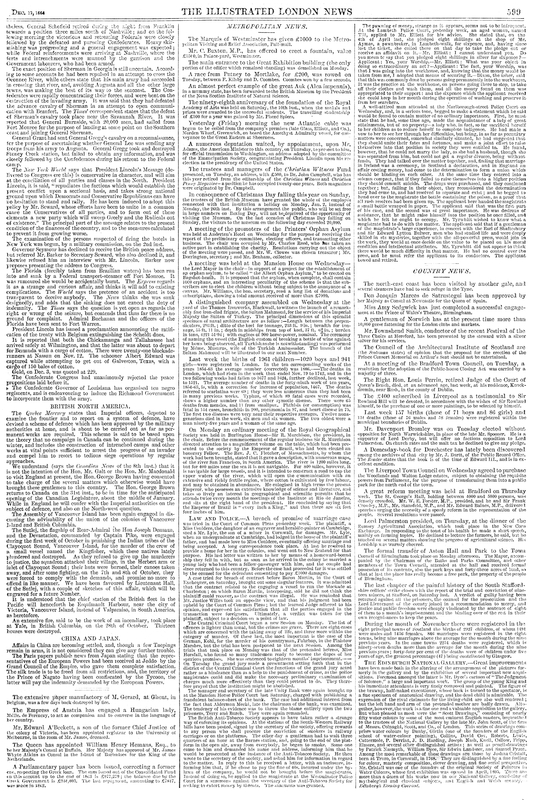 The dramatic interest of the piece, with the powerful acting of Mr. Benjamin Webster, will probably continue to draw for many nights a crowded audience who may not care to discuss its moral teaching. There are two novel and elaborate scenic effects, which greatly add to the attractions of the play. One of them represents a foundry, or engineer's factory, with all its machinery at work; the other is a view of Paris by moonlight, taking in the Pont Neuf and the Cité, with the towers of Notre Dame in the background. The reality of this picture is heightened by the introduction of lighted lamps and similar appliances, producing a spectacle which in its kind has not been surpassed. The engraving we here present gives a fair idea of it. Mr. Gates is the painter of this scene.